montage: Where is Montage December 2012? 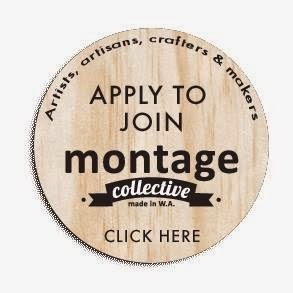 December is shaping up to be a huge month for the Montage Collective! A few bleeding fingers and sleepless nights are ahead but creating something we are passionate about and love to share is what we live for. Read on below for a list of appearances for each of out talented Montage designers as well as dates, times and locations. Fremantle Bazaar as "Montage Collective"
Unwrapped Part 1 & 2 as "Montage Collective"
Light up Leederville, shared stall with Anna Hadwin 8th of Dec. Sharing a stall at unwrapped as "Montage Collective" is Anna's crochet toys, eeva margita, Caldi, Neddynibbles, Tall Rabbit, Fluid Ink, Major Mitchell & Little mo and friends.